The Research and Recognition Project brings together international academics, researchers and therapists to examine the current evidence of the clinical efficacy of RTM techniques, considering how it can be effective in facilitating change, enrichment and symptom relief. Dr. Frank Bourke and his colleagues provide a critical appraisal of evidence-based research in the area to indicate the benefits of the approach and identify the need for an increase in randomized well-controlled clinical trials. For our articles, click here. The PTSD Research field has spent over $900M in the last ten years with no appreciable advances in treatment. The American Medical Association brought the problem into clear focus in its most prestigious Journal, JAMA, September 2015. The article made two important points about the field’s accepted evidence-based treatments for PTSD starting with a very pointed criticism, “… approximately two-thirds of troops continued to meet criteria for a PTSD diagnosis after “successful” treatment and one quarter dropped out”. Later it stated, “There is a need for improvement in existing PTSD treatments and for development and testing of novel evidence-based treatments, both trauma- focused and non–trauma-focused”. We believe that the results of the following five completed studies and feedback from the training initial training programs, reflect the implied and direct recommendations by the A.M.A. in the JAMA article. The R & R Project is seeking funding for RTM Training for counselors working with PTSD clients and evaluation of the clinical effectiveness of the RTM manualized training process. First Replication Study. Results were published in the JMVFH in 2017 (Tylee et al., 2017). Over 90% of the 30 male veterans were symptom and diagnosis free at the two- week, six-week, and twelve-month follow-ups. Second Replication Study. Results are in preparation for submission to a peer-reviewed Journal. Over 96% of the 30 women veterans have scored below diagnostic threshold on the PCL-M and PSS-I at two weeks post and all subsequent measures to one year, follow-ups. Third Replication Study. (NY $800 K Grant). 75 veteran study published in Psychotherapy Research (Gray, Budden-Potts, & Bourke, 2017). Over 90% of the male veterans completing treatment have scored below diagnostic threshold on the PCL-M and PSS-I. About half of those treated were followed to six months and retained freedom from PTSD intrusive symptoms and diagnosis. 5. 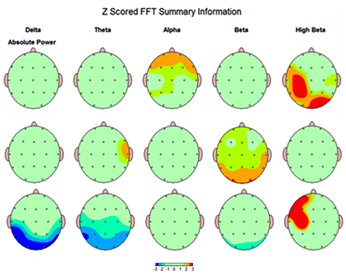 Neurological Studies using EEG, pre- and post-treatment, have begun at the Mind Research Network in New Mexico. 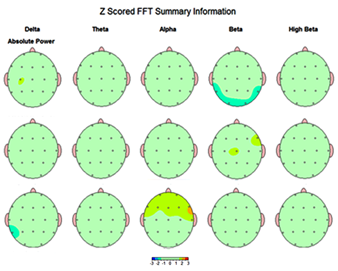 The first pilot “Quantitative EEG Markers of PTSD and Impact of the (RTM) Treatment Protocol has been submitted for publication to the J. of Biological Psychiatry. The research is being conducted in Dr Jeff Lewine’s laboratory at New Mexico’s, Mind Research Network for Neuro-diagnostic Discovery. 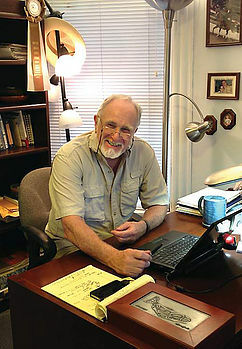 Dr Lewine is one of the foremost neurological research scientists in the US working on PTSD. The first graph below shows the results of the first three post-pilot RTM. Studies as compared with evidence-based treatments currently approved and used by the VA and Army using PSSI. Related to the JAMA Article cited above, note the following Table that show RTM has removed PTSD Diagnosis (along with nightmares and flashbacks) as measured by pre and post treatment PCL-M scores over 90% of the time in its first four scientific studies. The results hold for the twelve months followed thus far. Table Note: Dx = Diagnosis; Tx = Treatment. The three replication studies (2015, 2016, & 2016a) have been updated since publication. Participants in the 2014 study were required to have a pre-existing diagnosis of PTSD and one flashback or nightmare in the preceding 30 days. The cut off for military diagnosis was set at 45 Points. For all other studies, PCL-M status was determined by presenting with a PCL-M score of ≥ 50. Remission for military PTSD was defined as PCL-M < 50, complete loss of intrusive symptoms, and improved life adjustment and satisfaction. The RTM Protocol was presented to clinical staff at Walter Reed Medical Center Grand Rounds in November 2016. As a result of the presentation and follow-up, professional staff at Fort Belvoir Community Hospital asked to be taught the protocol, February 13-14, 2017, followed in April 2017 by professional, clinical and research staff at Walter Reed Army Medical Center. Both those trainings were very well received and have resulted in clinical and research networks beginnings with leading Army researchers and clinical/training staff. In a similar fashion to network developments after the Grand Rounds Presentation at Walter Reed, RTM research findings were presented to Staff at the Department of Veterans Affairs’ (VA) Innovation Demo Day, “Brain Trust: Pathways to InnoVAtion” in Boston. This led to meetings in Washington DC with VA executives to explore means to bring the treatment to VA counselors and that produced a pilot training in the administration of the RTM Protocol for 24 Veteran Health Administration clinical staff from the Northeast Community Health Division. They were successfully clinically trained in a five-day program held at their Towson Maryland training facility, in November 2017. On April 15, 2018 we were invited to present the RTM Protocol at the Annual World Conference of the Society for Brain Mapping and Therapeutics in Los Angeles, California. The presentation, “The Reconsolidation of Traumatic Memories Protocol (RTM) for PTSD: a brief treatment in the neural context of reconsolidation blockade” focused upon our current and ongoing research. On April 18, 2018 we met with Leila Jackson, Director of the VHA Center for Compassionate Innovation, Dr. Alyssa Adams and Michael Fisher, Director of the VA’s 380 Readjustment Counseling Services. Director Fisher assured us that our training for the outpatient service providers in November 2017 had been well received and that we could expect further training contracts from the VA in the not-too distant future. In May 2018, we were invited and submitted a Grant, with Dr. Michael Roy (M.D., MPH, FACP, COL (Ret), Professor of Medicine and Director of the Division of Military Internal Medicine at Uniformed Services University (USU). Together we submitted a letter of intent (LOI) for the grant. In the Spring Our LOI was accepted and the full Grant application has been submitted titled, “Reconsolidation of Traumatic memories to Resolve Posttraumatic Stress Disorder”. This Grant, will include the opportunity to work alongside of Dr. Roy and other CRNM/USU scientists, using their facilities at Walter Reed Military Hospital. It will place the RTM Protocol in the highest scientific circles for PTSD research in the world. Further, in April 2018, we met with Staff at Uniformed Services University Including Col. David Benedeck, MD, Chair of the Department of Psychiatry; Lt. Col. Gary Wynn, MD, Assistant Chair; Dr. Robert Ursano, MD, Professor of Psychiatry and Neuroscience, Director Center for the Study of Traumatic Stress; and Dr. Michael Roy. They assured us of the USUs full support for our efforts to develop a collaborative study at Walter Reed with Dr. Roy and further RTM investigations. Dr Harold Kudler, former Acting Assistant Deputy Under Secretary for Health for Patient Care Svc., Veterans Health, retired in June 2018. Dr. Kudler is a prominent figure not only in the VA's Executive but across the PTSD treatment and research field. Dr. Kudler has signed on to help the R & R Project get the RTM Protocol approved by the VA as evidentiary medicine, as soon as possible. A randomized controlled comparison study of RTM vs Prolonged Exposure using neurological pre and post measurements is under development for 2019. The study is a collaboration Dr. Jeff Lewine at the Mind Research Network in Albuquerque New Mexico and is being privately funded by Research and Recognition Project supporters. R and R was contracted to train 10 to 20 officers and Managers from the New York State Department of Corrections in the administration of the RTM protocol. The training was conducted in Albany NY in the second week of August 2018 and evaluated 9.5 on both the clinical need for the RTM Protocol for DOCCS employees and the quality of the training to administer the RTM Protocol. Leila Jackson, Director of the VHA Center for Compassionate Innovation, Dr. Alyssa Adams and Michael Fisher, Director of the VA’s 380 Readjustment Counseling Services have approved and begun formal contracting for a second RTM Training for 30 VA counselors from their West Coast Division to be run in June 2019. The Project has assembled a group of 18 NLP trainees with a minimum of ten years, experience to be certified as RTM Trainers in 2018. These RTM certified training experts will allow us to expand our training capabilities and allow some Institutes to provide RTM Training and RTM treatment, under contract with the R & R Project. The R & R project was delighted to contribute to the recent consultation on effective treatments for PTSD, currently being developed by UK agency for Health Care, NICE. NICE (National Institute for Health and Care Excellence) is a UK statutory body that has legal responsibility for developing guidance and standards for health care delivery across the UK. Treatments approved under NICE are then accepted as clinically proven and can be used for service delivery. The Project provided evidence of our own clinical trials which have shown five times, under strict scientific standards, that over 90% of the veterans (N 160) completing the program finished treatment with measured loss of their PTS Diagnosis and complete elimination of their PTS nightmares, flashbacks and directly related emotional symptoms. We are delighted to be included in this consultation and see this as a preliminary step to developing international trials in the RTM protocol. In Sept. 2018, Mike Roy from the Uniformed Services University (USU) and the R and R Project had a grant funded at the Center for Neuroscience and Regenerative Medicine (CNRM). The study will be run at Walter Reed Hospital and compare RTM against PE in a population of vets who suffer from both TBI and PTSD. The study is a large step forward in the scientific recognition of the RTM Protocol. In Oct. 2018 the third revision of the manualized RTM Training Process was used to train 30 licensed mental health professionals at the Mind Research network in Albuquerque N.M. The evaluation rated the training 9.5 both on the training materials and the clinical value of the RTM Protocol. The trained clinicians will treat and measure PTSD clients scores for PTSD remission before training certification. Foa, E., McLean, C., Zang, Y., Rosenfield, D., Yadin, E., Yarvis, J., … Peterson, A. (2018).Effect of Prolonged Exposure Therapy Delivered over 2 weeks vs 8 Weeks vs Present-Centered Therapy on PTSD Symptom Severity in Military Personnel. JAMA, 219(4), 354-364. DOI:10.1001/jama.2017.21242. Gray, R., Budden-Potts, D., & Bourke, F. The Reconsolidation of Traumatic Protocol (RTM) for the treatment of PTSD: A randomized waitlist study of 30 female veterans. In Preparation. Tylee, Daniel S., Gray, Richard, Glatt, Stephen J., & Bourke, Frank. (2017). Evaluation of the reconsolidation of traumatic memories protocol for the treatment of PTSD: a randomized, wait-list-controlled trial. Journal of Military, Veteran and Family Health, 3(1), 21-33. doi: 10.3138/jmvfh.4120.